Two rounds of 18 holes at Centennial Park in Lawrence, KS. Grip Equipment is the presenting sponsor providing bags for the Ace Fund. The revenue generated from this ace fund is being used to pay for a portable restroom, park fees and an added item that all (Pro and Am) will receive. Please consider participating in the Ace Fund. 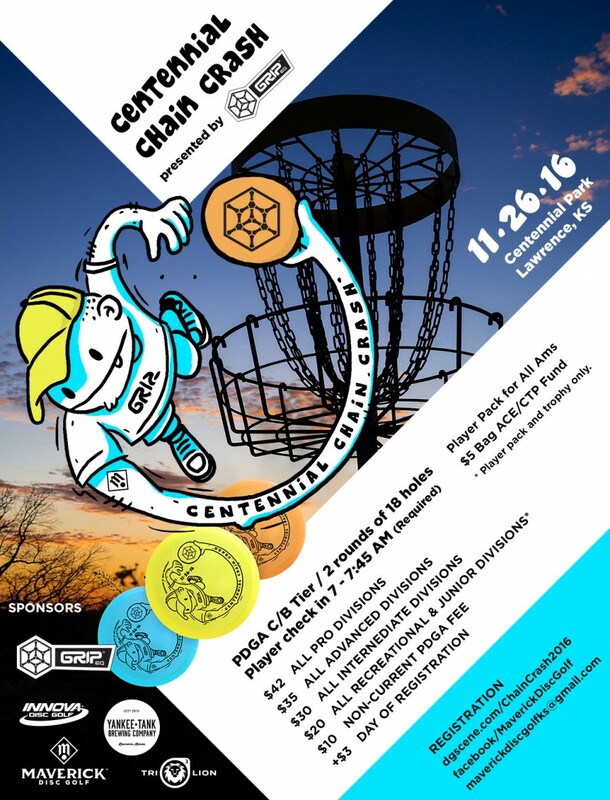 INNOVA Champion Discs is the disc sponsor. Yankee Tank Brewing is providing Qty 3, 1/6 Barrels of beer for free to players of legal drinking age after the second round is completed. Registration is open and the tournament is already 40% full. Because day of registration is becoming problematic, a $3 Day Of fee is being implemented for the purpose to encourage people to pre-register online prior to the closing of registration which is usually 5:30 - 6pm the night before. There will be a Win Your Card, Win a Prize for the second round. Undecided what it is yet, but probably something like a Sportsack or similar value. 16 days out, tournament is half full. 12 days out, only 11 spots left. For all players of legal age, there will be free beer after the second round provided by Yankee Tank Brewing. All amateurs will receive an Innova disc, choices are listed above. Plus, Win Your Card, Win a Prize for Second Round and CTPs. And hey the tournament is sold out.... but only kind of. If the weather is supposed to be good, Rob will expand the field to 90 sometime on Thanksgiving Day. if you get on the wait list (the next 14 people), there is a solid chance you'll get in. Hoping to see even more people in Lawrence the Saturday after Thanksgiving. Thanks to Innova and Grip for sponsoring! The decision to increase to 90 will be made on Thanksgiving day. This will only be 2 days before the tournament so the weather forecast should be *somewhat* accurate. Hopefully. If the weather is bad (sub 40 and raining) we'll leave it at 73 to keep things moving along faster. If the weather is good (50+ and sunny) we'll increase to 90 to let more people play. Something in-between? I'm not sure. We'll see. Those that are on the paid wait list will get bumped in first. If you do pay to be on wait list and don't get in, you'll get a full refund less than $1.50 that discgolfscene keeps for their handling fees.